Each user, in Quanta, can be assigned one or more roles. Quanta supports node-level access control, meaning that - for each node - you can decide exactly which roles can or can not do. Quanta roles are nothing else than nodes / folders, and they are created in the _roles folder. Those system roles are not contained into a folder, and therefore they are not editable or alterable in any way. So you can create anytime a new custom role (i.e. "editor"), by adding a new node inside the _roles folder. A visual form to assign roles to users, is envisioned, but still work in progress (see this issue). At the moment, an user's roles are stored in the data.json of the user, under the "roles". This user has been assigned the "admin" and "editor" roles. Here you can define which role can do what - in the specific node being edited. The Inherit value means: "no specific role has been set for this permission on this node. Use the permission that have been set on this node's father instead". 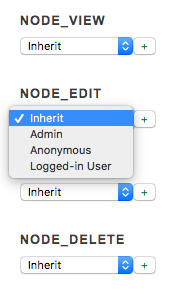 Note that if all nodes are set to inherit, the permission will be granted by default.